Weddings are all about the celebration of the union of two beautiful souls. Every Bride & Groom has some expectations about their wedding ceremony, so people try their level best to make their wedding a unique and memorable occasion. There are many important aspects which must be taken into consideration while planning a wedding. The most important factor that leaves the first impression on the attendees of the wedding ceremony is the theme wedding decorations. With all eyes fixed to the stage, it is paramount to create a design that stands out during the live event and photographs well also. 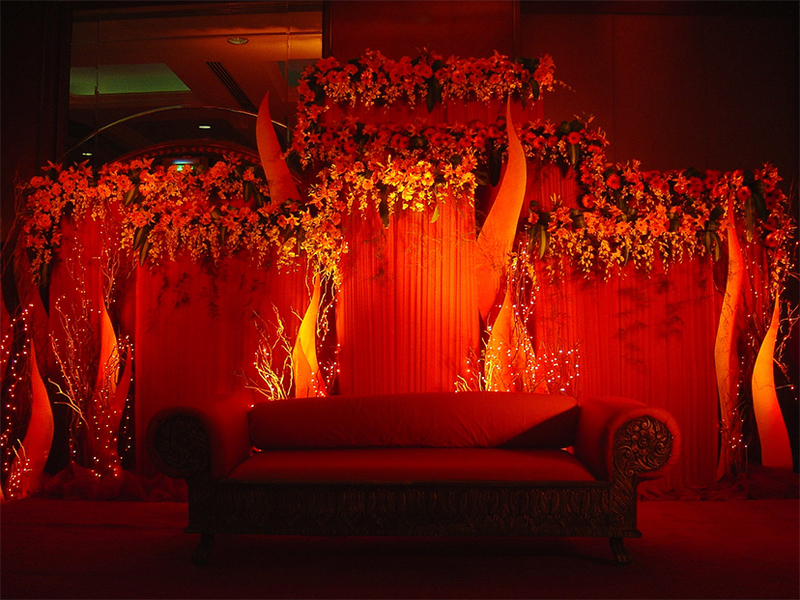 While planning the decor, one should keep in mind the weather, theme to be incorporated, scope of the venue, colours, flowers to be used, Bride & Groom attire and its colour, lighting, and modern innovative trends to get the pleasant, colourful & vibrant output making it all come together wonderfully. The first and foremost is to pick a theme for the decoration. A theme could be something which symbolises your personality, any of your favourite thing, or it could be just the colours you like. Once the theme is fixed ask your decorator to show you some samples or to create a sketch of the decor, so that you can work together to work on the possible improvisations. Another way to spruce up the event is by choosing colour themes that are essentially endearing. Many people have tried combinations like white and gold, pink and white, red and gold and so on. Try to choose a light shade and a dark shade so that they complement each other well. You can even personalize the colour selection by trying to include your partner’s and your favorite colours into the scheme. You don’t need to stick to just two colours after all, or you can play it safe and stick to classic wedding theme colours. Long flowing satin drapes are perfect to add elegance to any stage. The panache offered by colourful fabric drapes is worth trying out at your wedding. These are often used in connection with vintage wedding themes to create a more royal ambience. Just make sure cheap quality fabric is not used and it does not give a worn out feel. 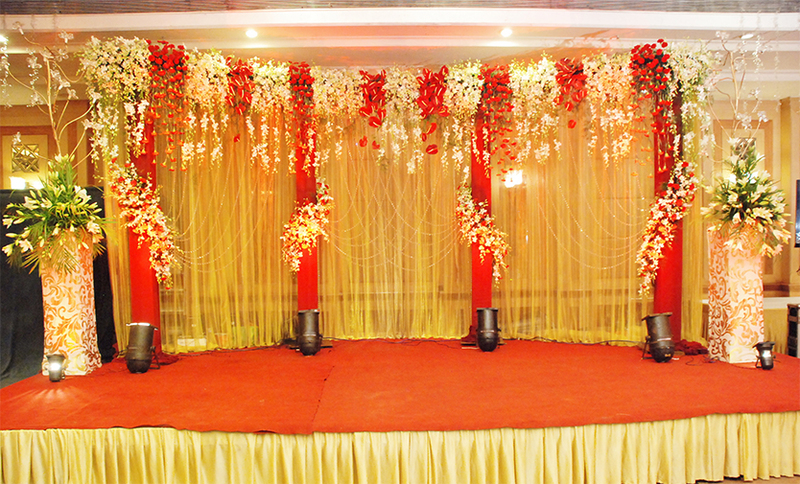 Add a bit of romance to the entire stage design with fairy lights illuminating the stage. These lights will help create a dreamy atmosphere, which will brighten up your special day immediately. Make sure you apply the theme and colour combinations in all important aspects of your wedding, such as Wedding Invitations, Venue Entrance, Venue Seating Arrangements, Table Tops, Photo Booths, Food Layout, Return Gift Baggage etc. You can even create a suiting prop to place it across the venue to add more prominence to the theme implied. Most of the Indian weddings are grand events with a lot of religious customs & traditions to be followed and performed and that too mostly on the stage where the wedding vows are exchanged. Your decor should be planned and executed in such a manner that it does not cause any inconvenience while these sacred rituals are performed. It is advisable to contact the experts who have specialised in the arrangement of wedding ceremonies. They have the experience as well as the skills of the modern day event management. The ideas can be shared with them so that they could arrange the ceremony according to your preferences and choices and make it the most memorable day not only for you but for all the attendees too. Kiyoh is a top in class Event Management Company specializing in A to Z of events in addition to holidays, leisure and advertisements. Be it a Wedding or a Corporate Event or a simple celebration for success, we make them ‘event’ful. Our services are catered to the specific needs of the client and we add a creative touch to it by preserving our professional standards. Our passion is what drives us and you can sense that from the million smiles that we have rendered. Experience the magic and see for yourself!